I am fascinated by the places which my ancestors were born in or lived in. 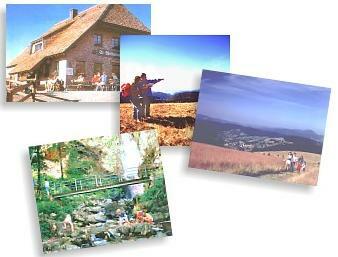 On this page, I have gathered together a number of pictures Todtnau in southern Germany - which is where my ancestors came from. 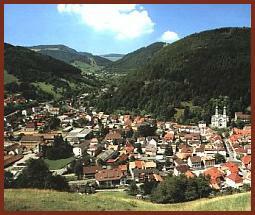 In the 12th century, Todtnau was just an area of a few farms. Near the end of the 13th century there was silver mining and a community sprang up into a village. By the end of the 15th century, the mining had stopped and people moved away. Records state that, once the mining stopped, there were approximately 10 families living there, consisting of 50-60 people. Two hundred years later, there were approximately 80 families and 500 people. Did they have big families or what!!! In 1689 there was a huge fire which devastated the village as most of the buildings were made of timber. There was a further fire in 1876 (hope my lot had nothing to do with it) which burned down a lot of the old buildings and the rebuilding that followed formed the basis of the way it looks now. By 1834 there were 955 people - including my Klingele ancestors - and for some years there had been a thriving brush-making industry. In 1870 the village became known as a health resort and the residents moved into the 'leisure' industry. It has grown into a huge centre for ski-ing, biking, walking and other sports - as well as attracting tourists for its healthy, clean air. Todtnau has grown from a village to a town to a city - although from the pictures, it still looks like a village - albeit a big one! Please click on green button to go back to English Gallery Pictures.